I thought it was best to re-instate the introductions to the galleries. Much more information can be found by reading through each items description and the forum will eventually contains even further references and discussions. Registration will give you access to the more interesting items which are normally hidden (approx 50 pages). Please note that you can click on the images within the gallery to advance to the next photograph, you do not need to click on the little numbers at the bottom. I have kept the text to a minimum and designed everything to give fast access to the images. There are over 1500 photographs on this site. Vase, pots and vessels were produced in numbers by Briglin and they come in all shapes, sizes, colours and patterns. They are not normally much bigger than 250mm or 300mm. Many were made in the standard patterns, but also many free items exist in numbers and examples of both are below. Often the pieces take on sculptural form with a narrow neck which is impractical except for a single bud. Not all the experimental shapes are successful and there are a lot of monsters out there, but the good ones are worth waiting for. Briglin Pottery made a big range of animal piggy banks and money boxes including cats, dogs, hedgehogs, rabbits and elephants. They are a lot of fun and they come in many shapes and sizes. There has been a lot of rubbish on the internet so be careful of what you bid on. Briglin churned these out and most of the items are not great but they made (and sold) them in for a long time so I have shown some examples here. The kitty banks were by Richard and Susan Parkinson from 1952 to 1963 (see A2) if you are interested in these then check out their other works that are very collectible at the gallery at the Pottery Studio web site. Eight mini Briglin Pottery animals including dougal, owls, rabbit, cat, squirrel, mole and elephant. Briglin Pottery made many different types of cups, mugs and goblets. They are probably the most common type of item. At present they can be bought relatively cheaply off the internet and are good value for hand made items. The goblets came in groups of six with a decanter but I’m not sure how other items were sold and if you could purchase then individually or not. I use many of my goblets, just remember not to put them into the dishwasher! 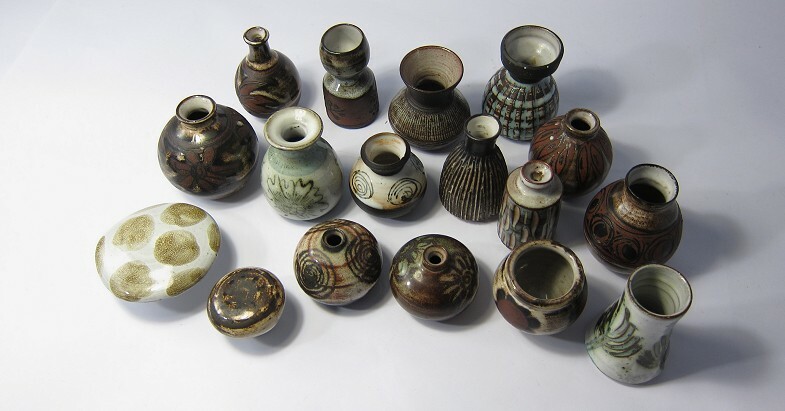 Often referred to as Bud Vases, these small miniatures or were casual items thrown by the potters. I assume they were sold as budget purchases for those who wanted to take something away from the shop but could not afford the larger items. Surely they cost pennies. If I remember rightly a small ‘Dinky Car’ in the 70’s was something like 25p, I’m assuming these cost about the same then. I am not sure if they were made at Baker Street? Certainly they were made in numbers for many years at Crawford Street and often crafted with great care. Big is not always best and less is sometimes more. Form is again very free but in general they range from 250mm to about 50mm in height. They appear in many of the photographs in AA’s book, in the background on the shelves in the shop. Over the years many must have been lost or thrown away as they are easily overlooked. A group of Briglin Pottery miniatures. Often unmarked they are becoming harder to find. I have tried to place alongside the Briglin Pottery Galleries quality items from contemporary potteries from the 50s, 60s and 70s. It’s sure that Briglin was influenced by what going on at the time and there are some direct parallels. If there is anyone out there who is only interested in collecting Briglin Pottery then I would strongly suggest you take a look at some of the other potteries active in the UK during the mid part of the 20th century. It was a rich time for ceramics with both diversity and quality. There is plenty more to get you interested at the wonderful www.studiopottery.com If you go away from this site not interested in Briglin Pottery but Celtic Pottery, or Stig Lindberg then it’s not such a bad thing.